The prosperity teaching — or prosperity gospel — is an aberrant doctrine, largely promoted by the Word-Faith movement. It is also a scam. Here’s how the prosperity gospel is sold: God wants you to be rich (and/or healthy), but He can not bless you unless you first send money (also known as a “seed-faith offering“) to whichever televangelist or teacher tells you about this scheme. This approach has been perfected by Oral Roberts, Kenneth Copeland, Marilyn Hickey, Benny Hinn, the late Paul and Jan Crouch (Trinity Broadcasting Network), Creflo Dollar, the Universal Church of the Kingdom of God, et al. Some preachers tell people to ‘sow seeds’ in faith (‘even if you cannot really afford to do so’), in order to soon ‘reap’ incredible rewards. Many promise healing from all manner of illnesses, deliverance from demonic influences, and usually a financial blessing — up to a hundred-fold return. 1) Positive Confession: The Theology of the Spoken Word (Rhematology), or thought actualization, is commonly known as positive confession. It stresses the inherent power of words and thoughts. Each person predestines his own future by what he says verbally and by how well he uses spiritual laws. As such, it is as if we live in a mechanistic universe instead of a personal one (see, Kenneth Copeland, Laws of Prosperity, p. 15; Charles Capps, The Tongue A Creative Force, pp. 117-118; Releasing the Ability of God, pp. 98-99, 101-104). 2) The Gospel of Health: Isaiah 53 is used to justify blanket coverage for the physical healing of every Christian who has enough faith. “…it is the plan of our Father God in His great love and His great mercy that no believer should ever be sick, that every believer should live his life full span down here on earth and that every believer should finally just fall asleep in Jesus” (Hagin, Seven Things You Should Know About Divine Healing, p. 21). Hagin also denies having a headache for forty-five years, labelling such as “simply symptoms rather than any indication of a headache” (In the Name of Jesus, p. 44). Christians who lack spiritual discernment easily fall victim to false teachings like the prosperity gospel. Much of the mail which Christian Research Institute receives concerns the teaching known variously as “positive confession,” the “faith” (or “Word-Faith”) teaching, and the “prosperity” doctrine. Some of the best-known American televangelists subscribe either partly or wholly to this teaching. Its chief representatives today seem to be Kenneth Copeland, Kenneth Hagin, Fred Price, Robert Tilton, and Benny Hinn, though there are many other evangelists, teachers, and writers promoting the teaching. It is our considered opinion that this teaching, at least in its complete form as expressed by the above men, is at best extremely aberrational and at worse heretical. (We use the term “aberrational” to refer to teaching which is decidedly unbiblical and damaging to authentic Christian faith, but which is not quite so heretical that its adherents must be considered non-Christians.) CRI has attempted to meet with these men and dialogue with them concerning their teachings, but most of them have refused. We were able, however, to meet with some of them and discuss a few of our concerns. We are continuing our efforts to engage these men in dialogue. Today, Meyer heads a ministry fast approaching $100 million a year and is among a dozen or so evangelical superstars headlining a revived, and very healthy, industry. 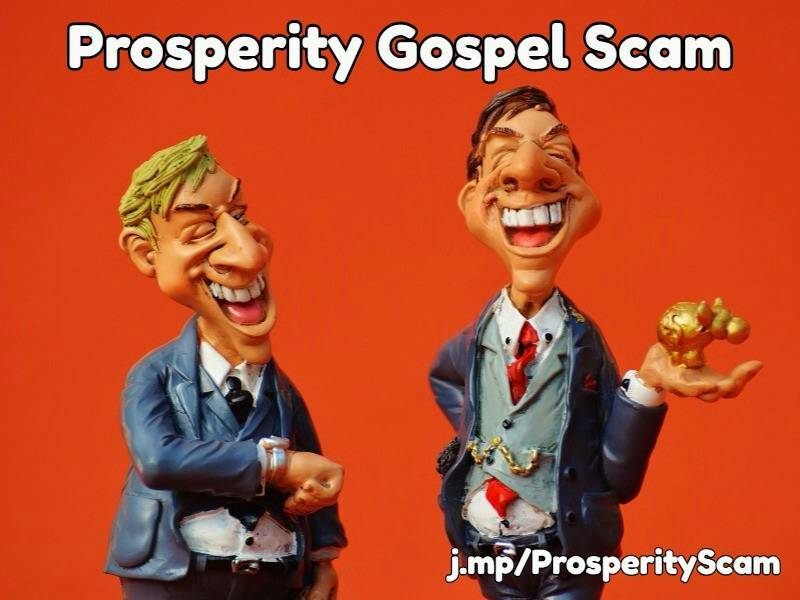 The prosperity gospel also has been called the “name it and claim it” theology. God wants His people to prosper, evangelists like Meyer maintain. Those who follow God and give generously to his ministries can have anything, and everything, they want. But critics, from Bible-quoting theologians to groups devoted to preserving the separation of church and state, abound. At best, they say, such a theology is a simplistic and misguided way of living. At worst, they say, it is dangerous. Michael Scott Horton, who teaches historical theology at the Westminister Theological Seminary in Escondido, Ca., calls the message a twisted interpretation of the Bible — a “wild and wacky theology. “Some of these people are charlatans,” Horton said. “Others are honestly dedicated to one of the most abhorrent errors in religious theology. Sociologist William Martin of Rice University said that most people who follow TV religious leaders put so much trust in them that they want them to thrive. Martin is a professor of sociology at the university, specializing in theology. The preachers’ wealth is “confirmation of what they are preaching,” Martin said. Even J. Lee Grady, editor of Charisma & Christian Life magazine has become alarmed at what he sees as the excesses of some TV preachers. Grady defends the principle that if you are stingy with your money, you will lack things in life; and if you are generous, you will get things in return. I began to look up all the Scriptures used in prosperity teaching, such as ”Give and it shall be given unto you.” When I put that Scripture back into its context, I found Christ was teaching on forgiveness, not on money. He was teaching us that by the same measure that we forgive, we will be forgiven. Bakker, who spent five years in prison for defrauding Heritage USA investors, says he has had a change of heart about the prosperity gospel. The same man who once told his PTL coworkers that “God wants you to be rich,” now says he made a tragic mistake. Sadly, Jim Bakker has returned to hucksterism, touting expensive ‘survival.’ He demonstrates a near-complete lack of discernment — as do those who follow him. Oral Roberts died this week and the obituaries have been abuzz with analyses of his life and legacy. Olsen, however, is wrong. He has evidently confused two categories. It is quite true that Kenneth Hagin is the main prosperity preacher who popularized word-faith doctrine–the notion that the words we speak determine the blessings we receive. Hagin borrowed that doctrine from an earlier, lesser-known preacher–E. W. Kenyon. (A mountain of evidence suggests that Hagin actually plagiarized large portions of his published works from Kenyon’s writings.) Kenyon had been strongly influenced by the teachings of New Thought, a 19th-century metaphysical cult similar to Christian Science. So Hagin’s word-faith doctrines had deeply cultic roots, but the idea fit perfectly with the prosperity doctrines that were already being taught by A. A. Allen, Oral Roberts, Jack Coe, and other faith-healers. The two ideas were natural complements to one another. Still, word-faith doctrine and the prosperity gospel are not synonymous. (Even the current Wikipedia entry acknowledges this: “Although [the Word of Faith movement] shares teachings in common with Prosperity theology, they are not the same thing.”) Prosperity doctrine is the notion that God’s favor is expressed mainly through physical health and material prosperity, and that these blessings are available for the claiming by anyone who has sufficient faith. Oral Roberts was certainly the 20th century’s leading advocate of that idea. His prosperity doctrine laid the foundation for an enormous media-based religious system, and Oral Roberts was indeed its chief architect. It is preposterous that Christianity Today would try to whitewash that fact. Prosperity teaching was what Roberts himself wanted to be remembered for. After he embraced prosperity doctrine, Oral Roberts’ best-known and most far-reaching brainchild was the Seed-Faith message. Roberts taught that money and material things donated to his organization were the seeds of prosperity and material blessings from God, and that God promises to multiply in miraculous ways whatever is given–and give many times more back to the donor. It was a simple, quasi-spiritual get-rich-quick scheme that appealed mainly to poor, disadvantaged, and desperate people. It generated untold millions for Roberts’ empire and was quickly adopted by a host of similarly-oriented Pentecostal and Charismatic media ministries. The Seed-Faith principle is the main cash-cow that built and has supported vast networks of televangelists who barter for their viewers’ money with fervent promises of “miracles”–and the miracles are invariably described in terms of material blessings, mainly money. Elsewhere I have compared this doctrine to the mentality of the post-WWII cargo cults. Tragically, the Seed-Faith message usurped and utterly replaced whatever gospel content there ever may have been in Oral Roberts’ preaching. Articles, books, videos, websites and other research resources on the Prosperity Gospel, also known as Prosperity Theology or Prosperity Teaching. Questions, comments or suggestions? Contact us. I am well aware that news of my cancer will be seen by many in the prosperity community as proof of something. I have heard enough sermons about those who “speak against God’s anointed” to know that it is inevitable, despite the fact that the book I wrote about them is very gentle. I understand. As Peters dug into the theology and history of the word of faith movement, he was more convinced than ever that Christians needed to know the truth about it. He discovered that the movement’s origins are not at all Christian; instead its roots can be traced directly to the metaphysical cults of the 19th century, Unitarianism, Christian Science, New Thought and even back to the early-church heresy known as Gnosticism. Abstract: This essay explores whether self or the Savior is at the heart of the prosperity gospel. An analysis and critique of its dogma indicates that it is predominantly anthropocentric, rather than Christocentric. This ego-focused outlook is likewise present in the health-and-wealth movement. One discovers that preachers of success are touting a religion of self in which people are the measure of all things. A detailed discussion of Ephesians 1:3- 23 provides a needed biblical response. One learns that the Son, not self, is at the heart of the Father’s plan of redemption. Also, it is in Christ alone that believers find forgiveness, hope, and wisdom. Only He is the meta-narrative of life, whether temporal or eternal in nature. Indeed, He is the sole reason for the existence of the church and the one who enables believers to complete their God-given work. Kate Bowler is a Canadian professor at Duke Divinity School who researches the prosperity gospel movement. She’s also 35, a wife and mother, and critically ill with cancer. In a widely shared New York Times piece “Death, the Prosperity Gospel, and Me,” the author of Blessed reflected on her research and how it informed her convictions on suffering and faith. Blessed: A History of the American Prosperity Gospel [Hardcover]. [ Kindle edition]. By Kate Bowler. Note: See this article, and this interview. Kate Bowler’s Blessed is the first book to fully explore the origins, unifying themes, and major figures of a burgeoning movement that now claims millions of followers in America. Bowler traces the roots of the prosperity gospel: from the touring mesmerists, metaphysical sages, pentecostal healers, business oracles, and princely prophets of the early 20th century; through mid-century positive thinkers like Norman Vincent Peale and revivalists like Oral Roberts and Kenneth Hagin; to today’s hugely successful prosperity preachers. Bowler focuses on such contemporary figures as Creflo Dollar, pastor of Atlanta’s 30,000-member World Changers Church International; Joel Osteen, known as “the smiling preacher,” with a weekly audience of seven million; T. D. Jakes, named by Time magazine one of America’s most influential new religious leaders; Joyce Meyer, evangelist and women’s empowerment guru; and many others. At almost any moment, day or night, the American public can tune in to these preachers-on TV, radio, podcasts, and in their megachurches-to hear the message that God desires to bless them with wealth and health. Bowler offers an interpretive framework for scholars and general readers alike to understand the diverse expressions of Christian abundance as a cohesive movement bound by shared understandings and common goals. In 2003 the Evangelical Alliance Commission on Unity and Truth among Evangelicals (ACUTE) published a report, edited by Andrew Perriman, on prosperity teaching. It was a direct response to the Word of Faith movement which seemed to contrast with mainstream evangelical teaching. The full title of the report is Faith, Health and Prosperity: A Report on ‘Word of Faith’ and ‘Positive Confession’ Theologies . The conclusions in the report come from Perriman’s book. Believing that the prosperity gospel is constructed upon faulty theology, authors David W. Jones and Russell S. Woodbridge take a closer look at five crucial areas of error relating to the prosperity gospel. In a fair but firm tone, the authors discuss the history and theology of the prosperity gospel movement to reveal its fraudulent core biblical teachings that have been historically and popularly misinterpreted, even by some of today’s most well-known pastors. After an introduction and assessment of the movement, readers are invited to take a look at Scripture to understand what the Bible really says about wealth, poverty, suffering, and giving. The Money Cult [Hard Cover] [ Kindle Edition] by Chris Lehmann. Scholars have written shelves of books trying to discern why religious faith remains so dominant in the United States, even while America is at the same time as consumerist, hedonistic and, above all, as capitalist as anywhere on Earth. The answer, in a socioeconomic if not spiritual sense, according to Lehmann’s eye-popping and prodigiously researched book, is simple. There never was a contradiction: from Pilgrim founders to the prophets of the gospel of prosperity, the genius—the presiding spirit—of American religion has been the same as the genius of American capitalism. It’s always been a money cult, with prosperity a sign of salvation and poverty something to self-help your way out of. The Word-Faith Controversy: Understanding the Health and Wealth Gospel [Paperback] by Robert M. Bowman Jr. Bowman’s ability to provide easy-to-understand evaluations of complex issues is as valuable as his balanced approach. Is it God’s will that believers be healthy, wealthy, and wise? Wise, definitely, but Robert M. Bowman questions those who teach a message of bodily health and financial prosperity through faith. In this balanced book, Bowman examines the word of faith movement by revealing the origins, teachers, and errors of this distortion of Christian doctrine. The faith healing and prosperity gospel aspects of the movement are what appeal to some and turn off others, causing a confusing and sometimes heated controversy. But the word of faith movement is, Bowman insists, “neither soundly orthodox nor thoroughly heretical.” Using the Bible as his touchstone, Bowman helps readers sort through the controversy and distinguish acceptable Pentecostal teachings from distorted offshoots. Prosperity Preachers Exposed A collection of video outtakes documenting how various prosperity preachers try to get their followers to give them money. See also this similar video. I know how to get along with humble means, and I also know how to live in prosperity; in any and every circumstance I have learned the secret of being filled and going hungry, both of having abundance and suffering need. 13 I can do all things through Him who strengthens me.